Warning. 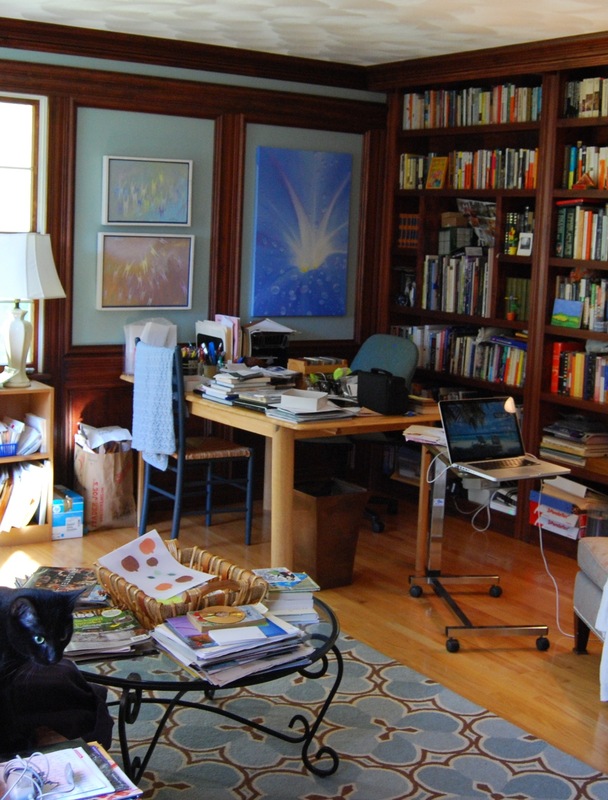 This post contains an unusually intense degree of navel-gazing and otherwise raving on and on about one’s home library, books, and related minutiae. If you find such material nauseating, turn away now. I’m staging a serious overhaul of the home library/office today, with Mom’s help. The question is — and please don’t cringe, fellow bibliophiles — shelve the books by author last name, or by jacket color? 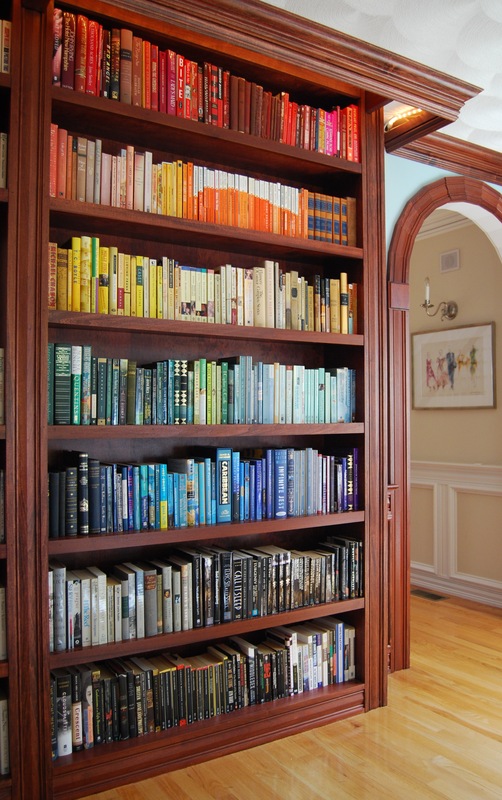 I know, I know….but I peruse and admire many design blogs and must admit that books shelved by color look fabulous. Although I’m not sure I can bring myself to mix genres…..help! I was amused by the considerable volume of responses. 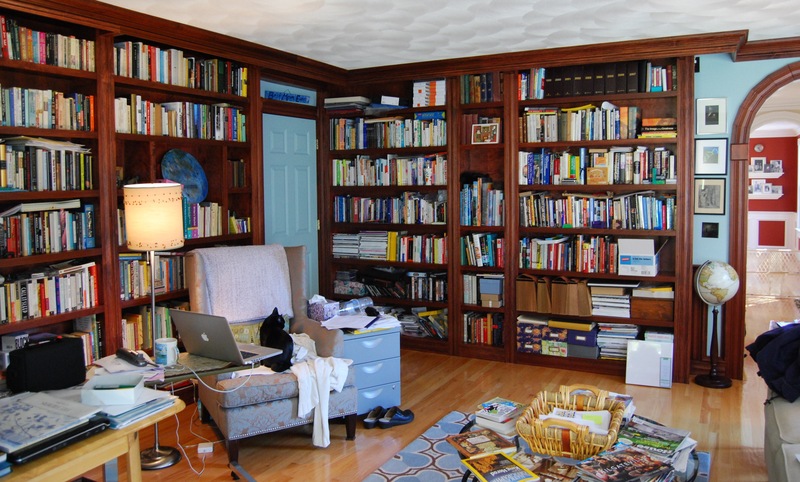 People feel VERY strongly about how to organize their books — as well they should. This is serious business, people! When I first heard of organizing books by color, I thought the premise was among the most ridiculous things I’d ever heard of. Not to mention sacrilegious. The whole idea sounded like “book as prop,” in the way that a professional decorator might buy small decorative things for a client’s room simply because they look nice against the wallpaper; nothing whatsoever to do with the item’s meaning or symbolism or its emotional value to the owner. Just “stuff.” Books, of course, are not “stuff.” Ew. But over time, I came across more instances of books organized by color that really looked beautiful. Not just a stack of three yellow books next to a yellow vase, but shelves organized wholesale by color. Still, how would you ever find anything if you didn’t organize all of your books by genre and then by author last name? So, alphabet or color? I was intrigued by the color principle, and I had to try it. (Obviously, by the photo I ran above, there isn’t much question about which way I went.) I can’t believe HOW LONG it took to sort all the books, but we did it. (All those “taupe” books — are they gray? Are they brown? Are they off-white?) It was a LOT of fun, I have to admit. And I came to realize fairly early on that finding a specific book was not going to be a problem. But more on that later. I now have a desk that I can actually use! I paid bills sitting at the desk last night, and everything I needed was in arm’s reach. My art supplies are organized in the hall closet around the corner, as there just isn’t room for everything in one place. But it all works. The basic footprint of the room hasn’t changed (months ago, we tried many different arrangements of the furniture, but nothing else worked). I did change out a yucky fiberboard bookshelf for a marginally better, longer bookshelf made by my ex-husband. (No, you can’t have it back!) Please ignore the hospital-style table on wheels (it’s one of the most practical things I own, and I use it all the time). So here’s my case for organizing books by color. In the first “after” photo above, fiction comprises the vertical shelf on the far right and the white shelf up the middle. That’s not really so many books. If I’m looking for a particular title, it’s not going to be hard to find even if I can’t remember the color of its spine. This is the only place I have adult fiction aside from my “to read” shelf on the other wall. The books to the left in the same photo are general nonfiction (biography, autobiography, and history). Again, these are mixed together, but it’s not a lot of shelf space for me to peruse if I need something. The fifth shelf is poetry. On the other wall, books are broken down by genre. 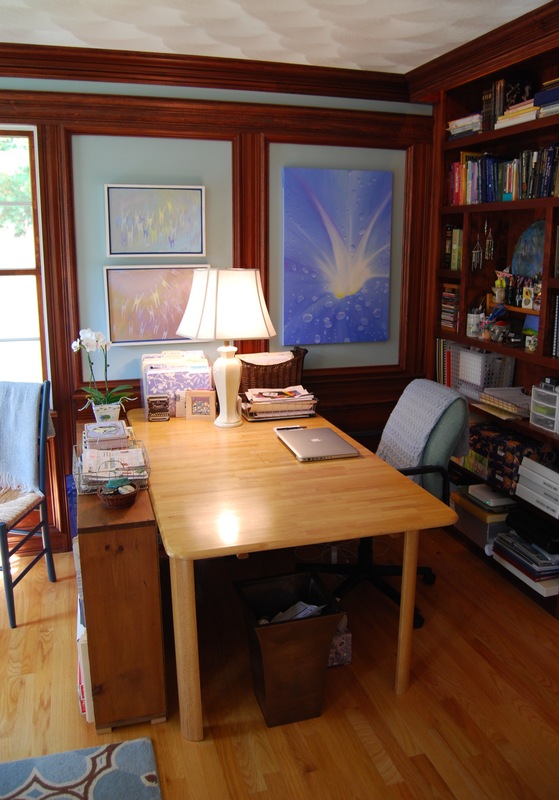 I have a shelf for editorial reference, a shelf for art reference, a shelf for books about writing, a shelf for books about creativity, a shelf for parenting, a shelf for self-help & metaphysical (yes, I have that many self-help and metaphysical books). There’s another shelf of semi-mixed nonfiction; a little chunk of current political books, a chunk of animal-related training books, a chunk of sports-related books, a section for gardening. Then there is the to-read shelf, as well a short fiction and plays. And so on. 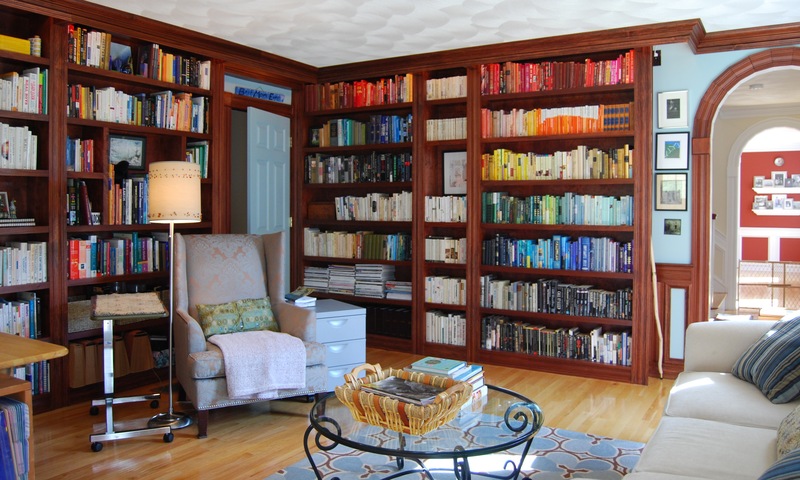 For each of these subsections, I organized books by color and shape, depending on what looked best for each shelf. Again, I’m not going to have trouble finding anything because I know what each subsection is, and no single subsection is more than a shelf long. So, now that I’ve dealt with the question of “how will you find anything?” I’ll get to why I think this is such a fabulous way to organize your books. First, a book is so much more than words on a page, or the author’s position in an alphabet. A book is a piece of art — even an old Bantam mass-market paperback — and to my mind, organizing books this way is something that honors each book as art. Positioning each book on a shelf in a way that maximizes its beauty (almost as “paint”) rather than by the name of the person who wrote it seems to me a more potent way to celebrate the beauty of a personal library. The shelves are pleasing and peaceful, without losing the vaguely chaotic and cozy look that is inherent in any library. The color progression is so eye-catching that I think it actually calls more attention to the books, not less — without dominating. What do you think? Thanks, Andy! Indeed — it’s all about making time, as opposed to finding it — yes? Well said, Miranda. Finding the time just never seems to happen, does it? love, love, love that post, that shelf, that whole concept …. i have shelf envy … that first pic is stunning …. i’m might just have to pin it so i’ll see it again …..
Love it! 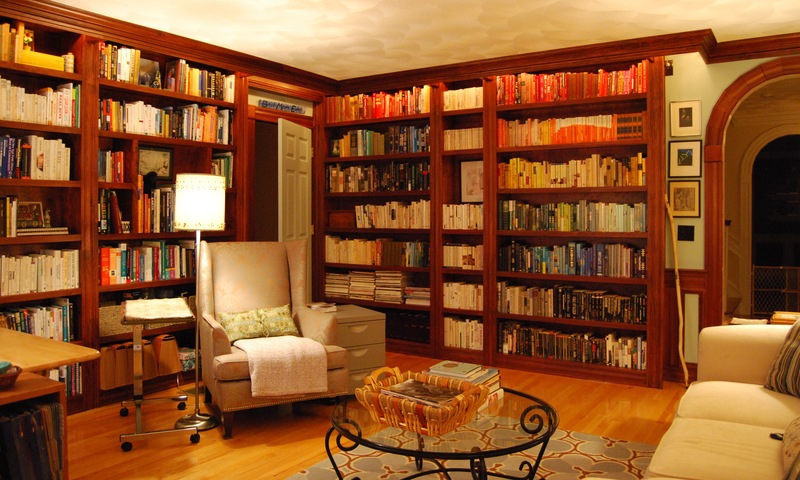 I can’t wait to have my own “library” room in my future house! I sort my books not my author, or genre, or title, just by series and then by possibly how much I like them and size. ha I actually have no idea! You must be feeling awesome after getting that done. I totally get how important a great functional piece is such as your hospital table. The after pictures are gorgeous although the before ones are tidier than what I have. It doesn’t take long for things to get out of control, so I try to stay on top of the picking-up on a daily basis. I stack papers in a basket for monthly filing, but otherwise I try not to let things go for too long…it’s impossible to write when my desk is messy. I just get too distracted! I have library envy. Seriously, that’s awesome! Even your before pictures are fantastic! And I agree with you on the hospital bed table. If I had room for one, I would, because they are SO handy. 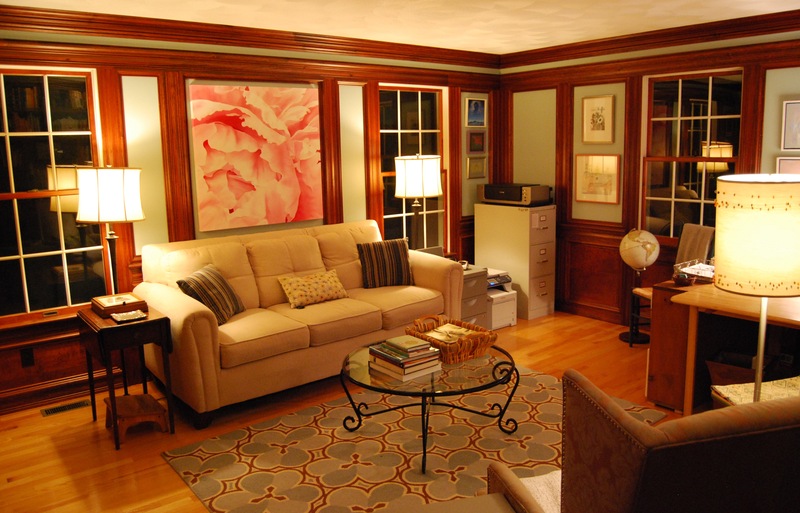 Beautiful house, Miranda. I’d hang out in that room all day and night! Looks awesome! Can’t wait until I have enough books to fill an entire library… Congrats or the reorganization!